This panoramic train connects the north of Europe to its south – right through the UNESCO World Heritage site of Rhaetian Railway, passing by glaciers on its way down to palm trees. Crossing the Alps in the Bernina Express certainly is one of the most spectacular ways to do it. Along the way, the Bernina Express rolls Hollywood-style over the 65-meter-high Landwasser Viaduct, the signature structure of the Rhaetian Railway and the UNESCO World Heritage site. Altogether the train passes through 55 tunnels and over 196 bridges on its way from Chur to Tirano. Travellers are treated to marvellous sights during their journey, like the Montebello curve with a view of the Bernina massif, the Morteratsch glacier, the three lakes Lej Pitschen, Lej Nair and Lago Bianco, the Alp Grüm and the Brusio Circular Viaduct. 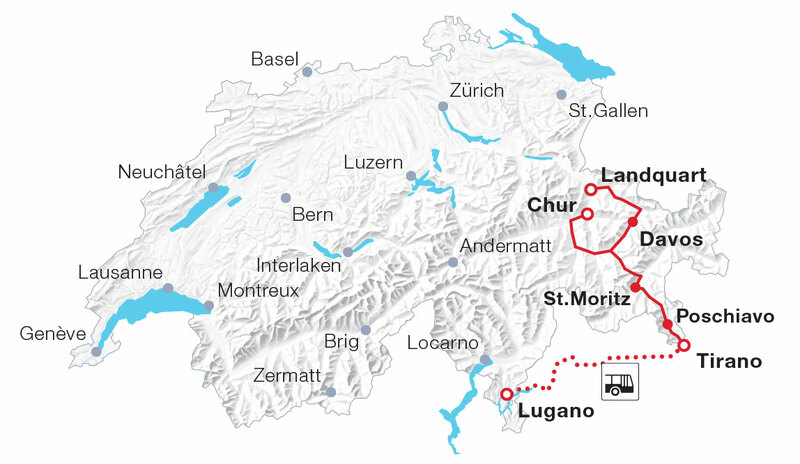 In summer, the journey can be extended from Tirano to Lugano aboard the Bernina Express bus. The Bernina Express minibar offers delicious snacks and refreshing beverages. The train does not feature a dining car. The guests will spend their lunchtime in the Italian town of Tirano.